I HATE YOU. It's called uploading videos, you moron. Hope you feel awesome. Still trying though! I haven't really been thinking about dressing lately since I've been at our cottage, where I usually focus on just being comfy, wearing shorts and a tank top. So while I'm here and feeling deprived of good clothes, I've decided to do a fall wishlist. Yes, it's that time of year my friends! K-Mart starts airing their back-to-school commercials starring that annoying little blue lightbulb, CVS workers are hanging up signs in the windows with deals on the "hottest binders" (is there such a thing? ), and the leaves are starting to change colors. I made up the leaves bit-but MAN don't you wish it were true? Not that I want school, but this sticky weather is making me retrieve my boring clothes! Anyways, here we go. Alas, my paint skills will never be as tight as Bianca's! 1. American Apparel sunglasses. These are magical. That model is lucky she can even be in their prescence, let alone get her picture taken with them, not to mention get to WEAR THEM. I bet sunshine is radiating out of her tush. LOATHE. 2. Fredflare romper thing. It's so cute and girly, but would also look awesome all ragged up. Could wear this Sam or Yoncto style. 3. FF 123, ABC sweatshirt. How theme-perfect is this? Fate, I tell you. If I got this I'd want a huge baggy size rather than tight and fitting so I could mess with it. 4. FF space shuttle backpack. I'd use this as an actual backpack, fr srs fr srs holmes. 5. FF neck-in brace. You seriously need to go to the link and see all the different ways this baby can be worn. Also doubles as strangling device. 6. FF roller skates. Complete with toe-stops (as featured in the Archie comics!). 7. FF colorblock headphones. Forget those pretentious earbuds that come with your iPod touch, colorful inconvenience is wear it's at! 8. AA sheer socks. Not like EVERYONE has these or anything, not like they're a tad overPRICED or anything, not like they wouldn't FIT me or anything. I need these. 10. AA windbreaker. It looks like candy. Really, really, shiny candy. 11. Luella bat mask. Hey now! Luella? That's ambitious. And delicious. And nutritious. Oy, the pun opportunities....can't....resist....AND MALICIOUS. 12. Jonathon Saunders dress. On sale for $1,376.25! Get em while they're hot! 13. Modcloth vintage pullover. So what if this top is sold out? It will always be in stock in my heart. 14. AA fanny pack. And you thought I was done with my 80's obsession! 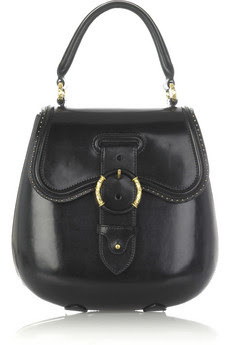 And last, the ultimate-CAPS AND BOLD AND ITALICS ULTIMATE- desire: THE ALEXANDER MCQUEEN TRIGGER SHOULDER BAG. It's duh-maz-ing. See that shadow under it? That means it's HOLY.